Taughmonagh YM beat South Antrim on Boxing Day to win the Ironside Cup and they beat them again on Thursday night to reach their second knock-out final of the season - the Gordon Hanna Trophy. The victory was more emphatic this time with Taughmonagh putting six goals past South in a one-sided semi-final. Curtis Moorehead led the way with two of the goals and the others came from Ronnie Hoy, Alan McCluskey, Matthew McKinstry and Barry Bloomer. Standing in the way of a second knock-out success for Taughmonagh YM will be Warren YM, who won the other semi-final on Thursday night against Glaston. Simon Walsh got the all-important goal for Warren as Glaston failed to find the back of the net. It should be an interesting decider with Warren having loads of knock-out final experience and willing to have a go at a last chance of winning a top trophy this season. The final is scheduled for Friday, May 20. Two of the top three teams in the South Antrim League Division 2, Victoria Athletic and Moira Albion II will contest the Whiteside Memorial Cup final tonight (Friday) at Stanley Park, 7pm.. Athletic had a narrow 3-2 win over Division 2 champions, Ballymacash YM III and Moira needed penalties to see off, Sandy Row II. Victoria Athletic turned the tables on Ballymacash YM III, who had beaten them to the Division 2 League title, when they scored a late winner in the Whiteside Memorial Cup semi-final at the Recreation Centre. They were 1-0 and 2-1 ahead before grabbing a late winner in a closely fought game. Matthew McMurray, Johnny Lyttle and a Phil McConnell penalty gave Athletic the advantage with Andy McAllister and Simon Hull replying for Ballymacash. The other semi-final was also a cracker which ended 3-3 and needed penalties to separate the teams. Mira held their nerve to set up a final between the second and third teams in the Division. Ballymacash Ym II clinched the South Antrim League title on Tuesday night when they beat Warren YM II 3-2. 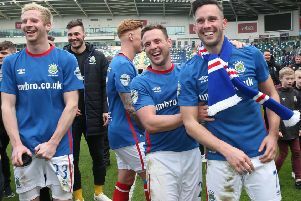 They join their own third eleven as title winners and it was a case of retaining the Division 1 championship which they also won last season. Edmundo Murdoch got two of the goals for the winners and Andrew Jackson got the other one, while the ever reliable, James Lynesss replied for Warren. Taughmonagh YM are still chasing Sandy Row at the top of the table following a 3-0 win over Ballymacash YM on Tuesday night. Taughmonagh took another step on Saturday with a 4-0 win over Glaston. Curtis Moorehead 2, Joshua Cahoon and Alan McCluskey were the scorers. Ballymacash YM II had already clinched the title and were 6-0 winners over Colin Valley III. Scorers were Colin Jamison 3, Gareth Johnston 2 and Jordan Johnston. Ballymacash YM II had their second big win of last week when they beat Belvoir FC II 6-4 to claim their place in the semi-finals. Gareth Shirlow hit a hat-trick, Gareth Johnston added two Eddie Murdoch got the other goal. There was an amazing game on Tuesday night when Belvoir FC II beat Orangefield OB III 8-6. Taughmonagh YM 3, Ballymacash YM 0; Glaston 0, Taughmonagh YM 4. Ballymacash YM II 6, Colin Valley III 0; Bloomfield III 2, Taughmonagh YM II 5. Whiteside Cup final Friday, May 13, 6.30pm at Stanley Park. Tomorrow (Saturday): PREMIER DIVISION: South Antrim v Glaston. Saturday May 14: SUPPLEMENTARY PLATE semi-finals: Woodvale YM v Ballymacash YM II, Bloomfield III v Ballymacash Rangers III, 6.30pm kick off. Friday May 20: SUPPLEMENTARY CUP, 6.30pm kick off. Friday May 27: GORDON HANNA FINAL, 6.30pm kick off. Ballymacash Rgs ground.